We (the whole family) just got back from a camping trip to Zhaawanong Aki (Southern land) or to be more specific we went camping in Ohio to visit sacred sites of the Anishinabeg, Shawnee, Miami, Delaware, Wyandot, Mingo, and the Mound builders. Most of the sites we visited were made by Kchi Anishinabeg (the ancestors/ the old Anishinabeg). I was in awe of the things we used to know... extensive mathematics and astronomical knowledge to build these great big earthworks, the artistry in our pottery, carvings, and metalwork... I felt humbled and ignorant in comparison to my ancestors, and out of shape... they could walk for miles and be fine, I had issues when climbing up a trail-head in the Appalachian mountains - 400 meters uphill very steep... then 2.3 miles around... but I did make it to the top! I went to these places because I was thinking about our sacred places in Michigan, and those Kchi Anishinabeg that came before us here to this mitten. I was wondering if these sites in Ohio had any connection to the ones here and with us Anishinabeg today. I went to learn and to pay my respects to these places and spirits of these places, I laid down my sayma (tobacco) and sang for the ancestors at each place. The archeologists have come to their own conclusions and have written their own narratives as to what these "moundbuilders" "Fort Ancients" people were doing. But I looked with my Anishinabe eyes and saw my relatives. I saw the types of things that they made, the earthworks, the petroglyphs and understood the familiar, understood some of the meanings, which often did not mesh with the signs that the historical/archeological society had placed at the sites. I also became alarmed and sad because of the destruction that had happened at these sites -- from vandals removing a large chunk of the sandstone petroglyph to spray painting and carving on the petroglyphs to Camp Sherman being erected right on top of and destroying Mound City Earthworks which they rebuilt... but it is not the same.. .and shows severe disrespect for these sacred sites/burial mounds and all the Anishinabeg people. I spoke briefly with the Ranger who works at the Kchi Ginebig Mound and she told me all these stories about New Agers burying things in the mound and jumping around on it... to telling me about the local baptist preachers preaching at the mounds and telling folks that it is the Garden of Eden, to people who think it is a spacecraft landing strip - to telling me that there are no Indians in Ohio (Federal Indian Removal Policy) and then explaining to me that the "Museum display used to be better... there used to be two Indian skeletons on display here an adult male and a child but they came and took them away, then replaced them with plastic replicas and then they were taken away... " This horrified me to no end. 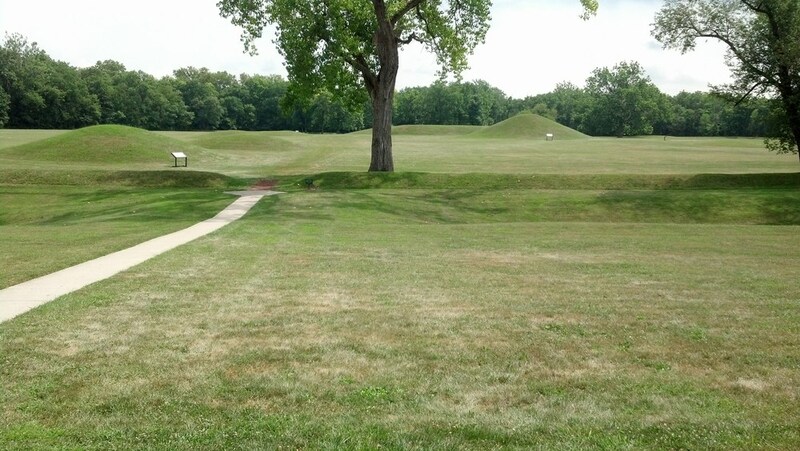 That they had not repatriated the remains back into the mounds made me want to cry. She told me that the items were owned by the Peabody Museum so when I got home I looked up their collection online and sure enough there were several pages of complete human remains that they had taken from the Hopewell sites not to mention thousands of Pipes and other grave goods that they have in their collection. What about NAGPRA (Native American Graves Protection and Repatriation Act? I think that our people our Anishinabeg/Shawnee/Miami/Delaware people here in Michigan and in Oklahoma should go to these sites and force the protection of NAGPRA. I think all of the petroglyph and Mound and Earthwork sites should be owned by the tribes collectively and protected by a complete enclosure - viewed through bullet proof plexiglass and steel to protect these places from humans and natural elements. Here you can see the large gouged out portion which as far as I have been able to find out, must have happened prior to the 1930s as I found a photo from that time and it already was missing. 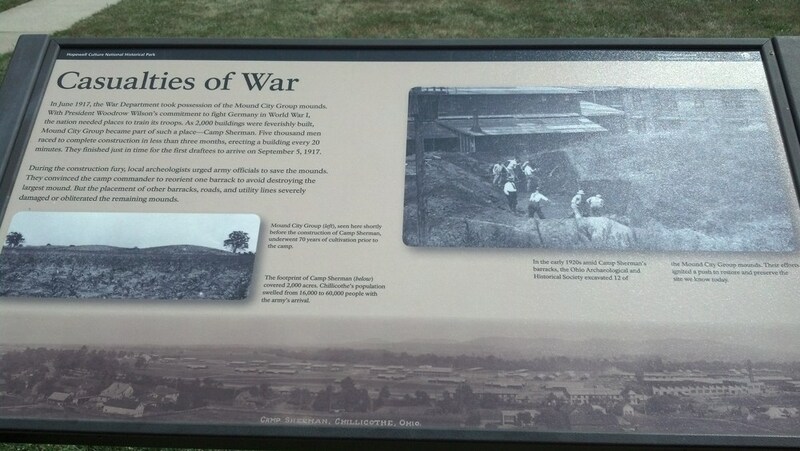 at the bottom of this sign is a black and white photo of Camp Sherman erected exactly over the Mound City site.